A useful little application called Activity Monitor is specially designed to show you just how hard your CPU, hard drives, network equipment, and memory modules are working behind the scenes. To run Activity Monitor, open the Utilities folder in your Applications folder. To display each different type of usage, click the buttons in the lower half of the window; the lower panel changes to reflect the desired type. 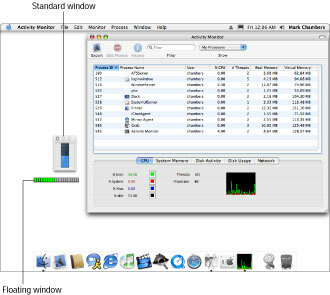 For example, if you click System Memory, you see the amount of unused memory; click CPU or Network to display real-time usage of your Mac’s CPU and network connections. Floating CPU window: (Bottom-left of Figure 1.) This is the smallest display of CPU usage; the higher the CPU usage, the higher the reading on the monitor. You can arrange the floating window in horizontal or vertical mode from the Activity Monitor menu. Standard window: (Above the floating window in Figure 1.) This is the standard CPU monitoring window, which uses a blue thermometer-like display. The display works the same as the floating window. Figure 1: How hard is your processor really working? Whichever type of display you choose, you can drag the window anywhere that you like on your Mac OS X Desktop. Use the real-time feedback to determine how well your system CPU is performing when you’re running applications or performing tasks in Mac OS X. If this meter stays peaked for long periods of time while you’re using a range of applications, your processor is running at full capacity. You can even monitor CPU, network, hard drive, or memory usage right from the Dock! Choose Monitor –> Dock Icon; then choose what type of real-time graph you want to display in your Dock. (Feeling like a Panther power user yet?) When you’re monitoring CPU usage from the Dock, the green portion of the bar indicates the amount of processor time used by application software, and the red portion of the bar indicates the CPU time given to the Mac OS X operating system. Note, however, that seeing your CPU capacity at its max does not necessarily mean that you need a faster CPU or a new computer. For example, when running applications such as Photoshop or Premiere, the Activity Monitor on your G4 iMac may often be pegged (indicating maximum use) for several seconds at a time. The rest of the time, it barely moves. Whether a computer is actually fast enough for you and the applications that you run is more of a subjective call on your part.